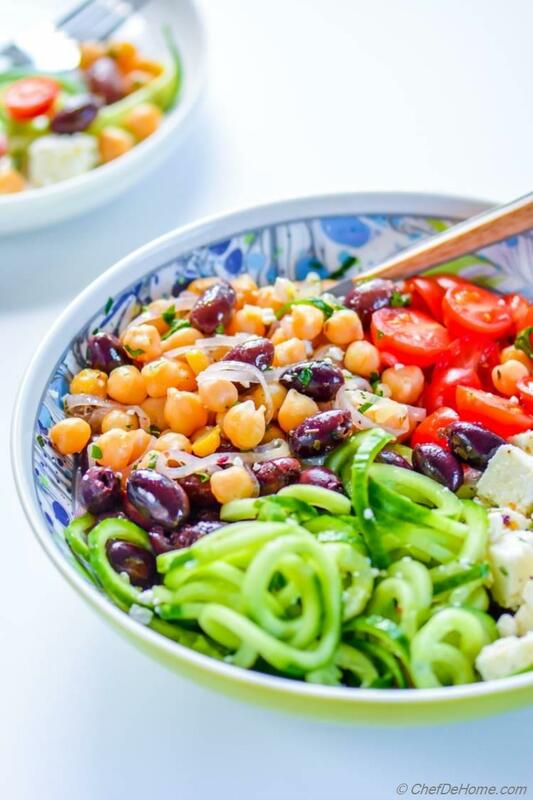 Mediterranean flavors inspired warm Chickpea Salad with black olives, feta, a zesty oregano-shallot dressing and all the goodness of spiralized cucumber completing the need of pasta! Oh, and just 10 minutes from kitchen to lunch or dinner table... Or whenever you want to enjoy some greek-style chickpea goodness! I must say, I did not plan to end a cold week with a lite salad... But it so happened that until day before yesterday, we had day time high temperature of 90 degrees and all of sudden since yesterday it started raining heavily! Now, where until Wednesday we were planning to switch-on A.C, today we are back with jackets and comforter. God save from this ever changing weather! Chickpeas are by far the most consumed legume in home. 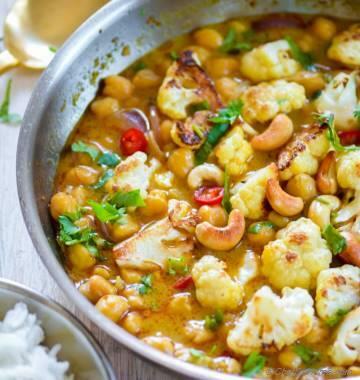 Ranging from chickpea curries to salads, I often serving chickpeas in meal. Actually, whenever I boil chickpeas for making a curry, I always save a cup or two for next day's lunch salad. Now, since I have spirlazier, I'm often finding reasons to add some to everything I cook. 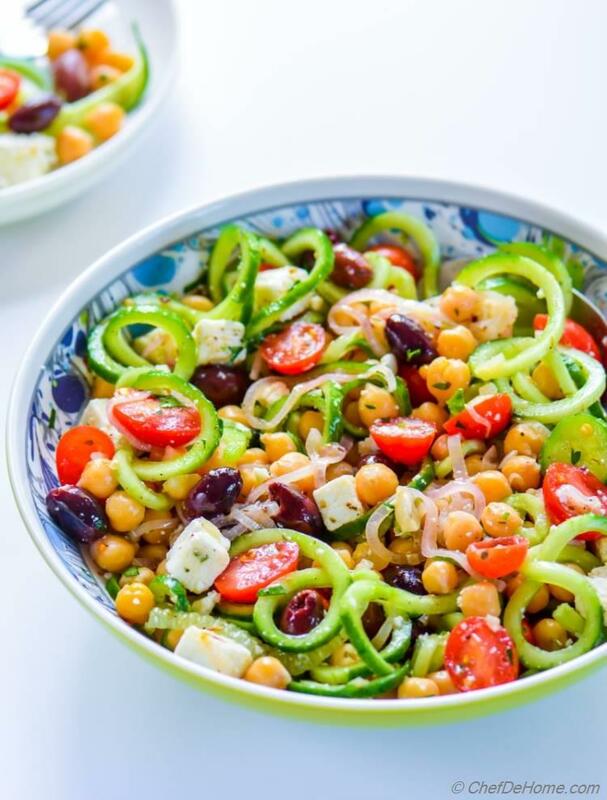 So, last weekend as sun was shining like Summer days.... chickpeas and cucumber with lemony shallot dressing allured me to a scrumptious lunch! This salad can be made with simple sliced cucumbers too, or just slice it paper thin like you would eat papperdelle. 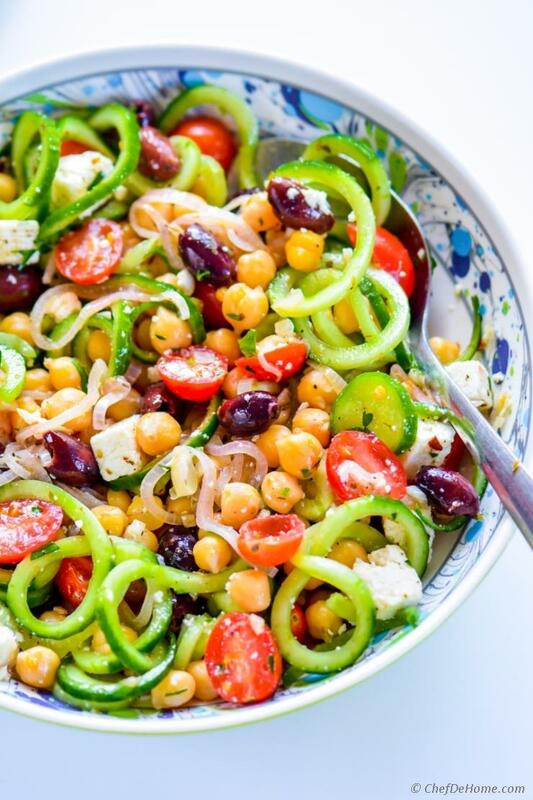 Spiralized cucumber are not must for this salad but they do add some pizzaz. 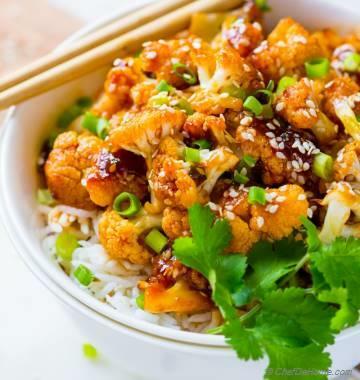 And specially if your family love pasta salads, these Mediterranean flavors, goodness of whole grain chickpeas, and carb-free pasta will not let'em feel need of pasta. 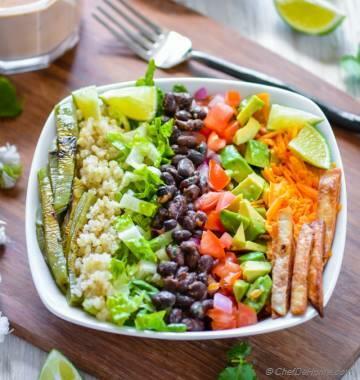 Honestly, this salad is perfect example of famous saying : don't eat less eat smart. 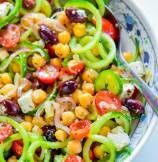 Even though lite and healthy, this Chickpea salad is still a hearty one. It will fill you up pretty quickly but will not way you down. Time to get into beach bodies, friends! ;) That too without compromising flavor. Since I had planned a warm chickpea salad, I sauteed the chickpeas briefly with shallot dressing. 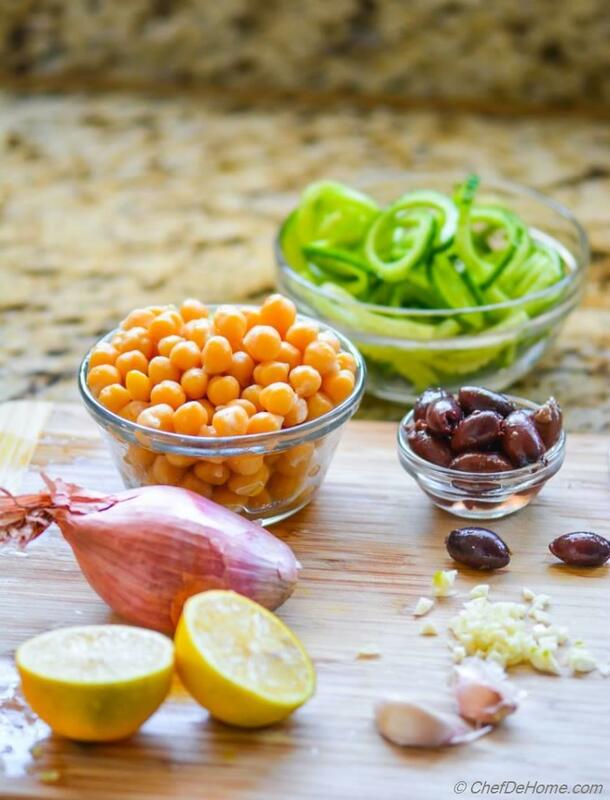 This little step really enhance the flavor of chickpeas. However, you don't need to serve this salad warm. I mostly serve it at room temperature or even cold. Make-Ahead: For the record, chickpeas and other ingredients in this salad tastes even more scrumptious the next day. Only one little step, cucumber might release water if slated and kept cut overnight. So, if you serving this salad for dinner and making it morning or a day before.... mix everything but cucumber. Sounds good? Wish you all a great weekend. Signing-off with a promise note to share something warm and comforting for this cold weather..... For now, do make this salad and keep it read for weekday lunch as Next Weekend is going to be in 90s again. Total Time 10 minutes Prep Time 5 minutes Cook Time 5 minutes Difficulty Easy Yields 4 Servings Serves 4 Notes 2 substantial servings or 4 side servings. 1. Heat 2 tbsp oil in saute pan. Add minced garlic and shallot and saute for 1-2 minutes or until onions are soft but not burnt. 2. Add in lemon juice and generous pinch or 2 of salt and black pepper, red chili flakes with chickpea and toss well. 3. Transfer chickpeas to a wide salad bowl. 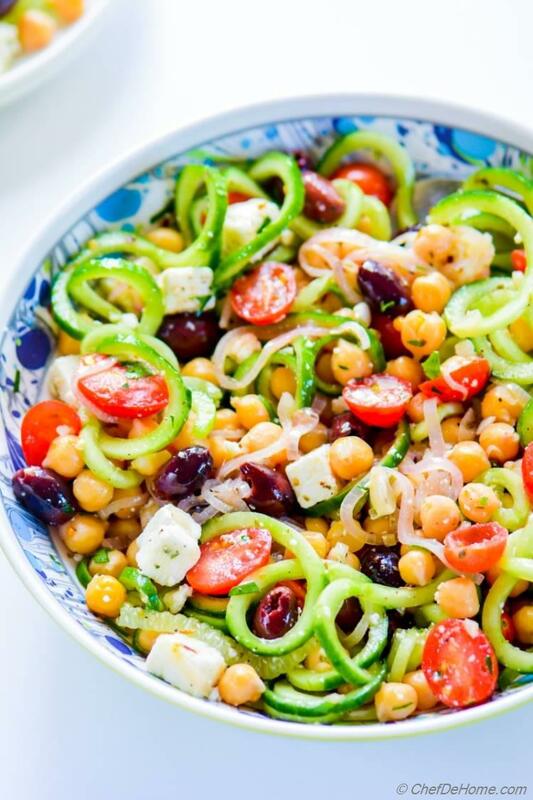 Add rest of salad ingredients - feta, tomatoes, spiralized cucumber, and olives. Gently toss to combine. Serve and enjoy! Love the sound of that warm shallot dressing! thanks, Marla! Warm shallot dressing is actually very delicious. I don't see Shallots listed as an ingredient. Thank you. thanks for pointing out, Jeanna! I added the shallot in ingredient list. I hope you get chance to try it. Thanks for stopping by!